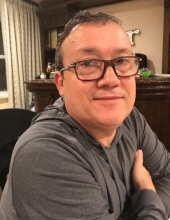 Luis Manuel Pereira Reis, 55, passed away peacefully, at his home in Newark on Monday, November 19, 2018, with his loving family by his side. He was born in Labrengos, Cantanhede Portugal and came to the United States 1988. Luis was the Manager of the Park Avenue Food Market in Newark, NJ for 30 years. Beloved son of Solene Terrantez Reis and the late Antonio; devoted husband of Isaura Maria Rodrigues (nee Diogo) Reis; loving father of Richard Reis and Michele Gomes and her husband Andre; brother of Dinis Reis; cherished grandfather of Emily and Adelind. The Funeral for Luis will be held on Saturday, November 24, 2018 at 8:30 am the Buyus Funeral Home 426 Lafayette St.at Wilson Ave., Newark 07105. Thence to Holy Cross Church, Harrison, where at 10 am the Funeral Mass will be offered. Interment to follow at Holy Cross Cemetery, North Arlington, NJ. Relatives and friends are welcome to attend. Visitation for Luis will be on Friday, November 23, 2018 from 4 - 8 pm. To send flowers or a remembrance gift to the family of Luis Manuel Reis, please visit our Tribute Store. "Email Address" would like to share the life celebration of Luis Manuel Reis. Click on the "link" to go to share a favorite memory or leave a condolence message for the family.